Shooting scene. Photo by Rick Macomber. 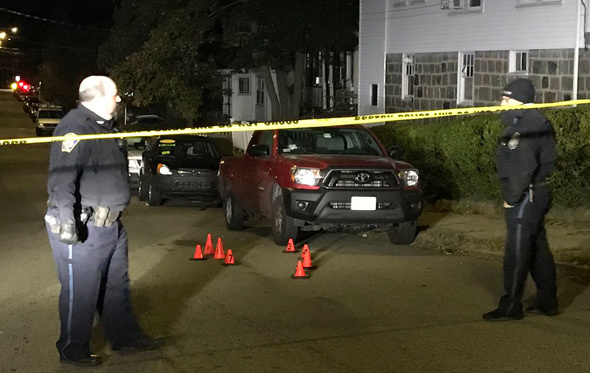 A man was shot on Wellsmere Road near Kittridge Street around 11:45 p.m. on Thursday. Rick Macomber reports multiple rounds were fired into a pickup truck. WCVB reports the victim's injuries were not life threatening. Judging from the shell casing markers, that was a lot of shooting at really close range. Not random. Hope the person is OK. Right after the Sox clinched. 7 or so pretty quick shots. Really happy the victim is expected to survive. Some neighbors over the years have heard the ubiquitous illegal fireworks going off all summer and worried about gun shots. But you know gunshots when you hear them. What a terrible few weeks of violence in Boston.